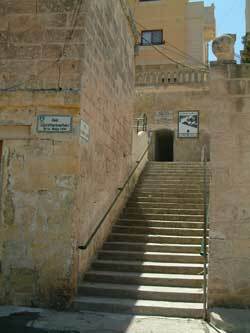 Entire families helped to dig out tunnels and caves to escape the bombing Malta was subjected to in World War II. 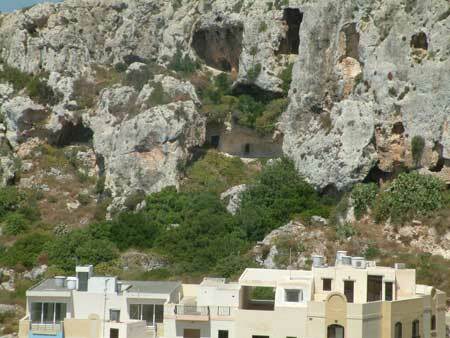 The cave studded limestone cliff above is near Mellieha Bay. The best place to see it is from the cafe above the beautiful Church of Our Lady of Victory where there are panoramic views of Mellieha Bay, Gozo and Comino. Visit the Mellieha Air Raid Shelters nearby to find out how the residents of Mellieha survived the war, how the shelter was excavated entirely by hand and see the living conditions including the medical section with a maternity room. There is also a small walled beautifully maintained cemetary nearby that demonstrates the Roman Catholic tradition of caring for graves.